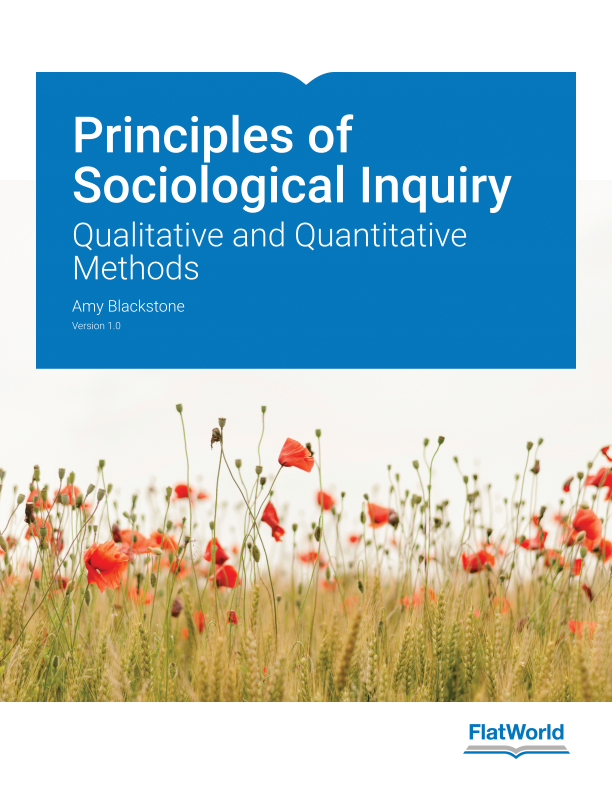 In Principles of Sociological Inquiry: Qualitative and Quantitative Methods, Blackstone stresses the importance of understanding research methods in order to pursue an advanced degree. As an active researcher herself, Blackstone is acutely aware of the need for a balanced approach of both qualitative and quantitative methods of sociological inquiry. Therefore, the three overriding objectives of this textbook are: Relevance, Balance, and Accessibility. Blackstone emphasizes the relevance of research methods for the everyday lives of its readers, undergraduate students. Learning objectives at the start of every section. Key take-aways and exercises concluding each section. 1.2 How Do We Know What We Know? 1.4 Why Should We Care? 2.1 What’s Theory Got To Do With It? 4.5 Is It A Question? 8.2 Survey Research: What Is It And When Should It Be Used? 9.2 Interview Research: What Is It And When Should It Be Used? 10.2 Field Research: What Is It And When To Use It? 11.2 Unobtrusive Research: What Is It And When To Use It? 15.5 Revisiting An Earlier Question: Why Should We Care? Amy Blackstone is Professor in Sociology and the Margaret Chase Smith Policy Center at the University of Maine where she directs Maine NEW Leadership, a residential institute for undergraduate students interested in women’s civic and political leadership. Using qualitative and quantitative methods, her research includes studies of workplace harassment, childfree adults, and civic engagement. Her work has appeared in a variety of journals and edited volumes including Gender & Society, Law & Society Review, American Sociological Review, and the Journal of Contemporary Ethnography. Dr. Blackstone’s research has been featured in media outlets including TIME, CNN, The Katie Show, Elle, BuzzFeed, Bloomberg News, The Atlantic, and other national and international venues. She is author of CHILDFREE BY CHOICE: The Movement Redefining Family and Creating a New Age of Independence (Dutton, 2019). Blackstone has received the University of Maine’s College of Liberal Arts and Sciences Outstanding Faculty Award in Teaching/Advising. She received her PhD in sociology at the University of Minnesota and her BA in sociology at Luther College.